It’s spring now. All the best writers advise not to start with the weather. But here in the high desert, spring is not weather. It is a miracle. Our winter was milder than I have seen since I have lived here. We were below zero for much of December but then, winter just sort of fizzled out. I misplaced my coat and didn't find it (trunk of the other car) for weeks. It didn’t matter. I didn’t need one. Some years winter is hard. Heart and soul hard. It is bone chilling exhausting. It is a long slow game of chicken. But winter rarely flinches. Even after an easy-ish winter, spring feels like a miracle. We are high in the air and north on the map. The light just seems to go away in the fall. There is daylight in the winter but it is a soft grey light. It hangs low, barely holding back the dark. It doesn’t last long. In the spring, the sun comes back. It’s high in the bright blue sky. It shines and warms. The darkness will wait until late fall again. We all know, when we are cold and winter-weary that spring will come again. There will be irises in the yard and calves in the pasture. The icy mountain passes between me and home and loved ones will thaw. There will be visits. My children will run wild on the mountain. I will go some. But I will stay home too, and write in the solitary sunshine. A little more than a year ago, one of my favorite people, Angela, told me that her family was informally fostering a little girl with hopes to adopt. She shared a little of the baby’s history with me. I was delighted. Angela and her husband Reed are the best kind people. Every child should make it to such a safe and happy home. But I felt something else too. I felt like I was part of this girl’s team. I felt like I had some little role to play. This was odd since this baby girl was many states away. It was unlikely I would ever see her. But still that feeling persisted. So I did what I could, and I prayed. Reed and Angela have fostered many children. They have loved and healed little ones and let them go. But this was different. This was a little one with a rough start and an uncertain future. This girl felt like theirs. I asked Angela if I could buy a blessing dress for her little one. She said yes. Adoption had to happen first, of course. And that was contested (not by the birth parents). But I needed to get that dress. He did know, of course. The adoption was successful. I sent the dress. Her daddy took her in his arms and gave her the name Julie Grace. Not long after, she wore her long white dress to the temple to be sealed. I saw pictures of her and her new family complete with two proud big brothers. And I felt such joy. Julie Grace lives here now. The baby I thought I would never see lives in my same tiny town. A whirlwind job offer brought them. Here she was. As sudden and bright as the first spring day after the grey, she bounced through my front door. 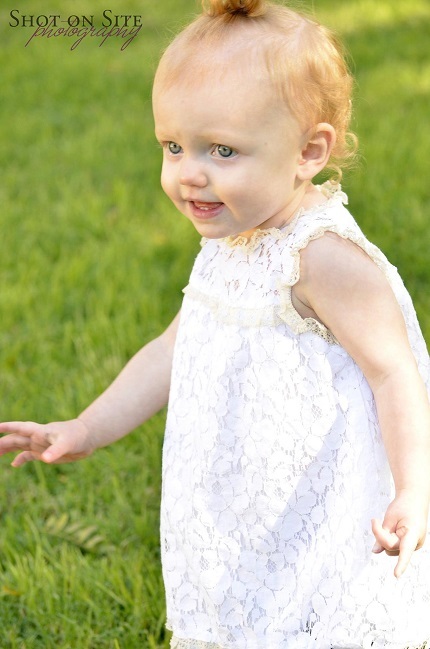 She has red curls and pale blue eyes. She is sweet and snuggly. She is mischievous and funny. She is not my daughter, but that seems a silly reason not to love her devotedly. She likes me too. This is unprecedented; babies never like me. But I am quite sure she knows I am on her team. Or I am the lady that will take her out to see the cows ten thousand times and give her whatever I want. But she did ask her mother for me, and I smiled for days. I didn’t know that there was a little girl who would be springtime. Sometimes we don’t notice the grey when little winters of our hearts begin to last too long. We think we cannot bear another moment in the cold. I don’t know why I am on her team. I don’t know why being her fairy Bird-mother was exactly the best thing for me. But I am so profoundly grateful for her little whispers and giggles, and for all the other little springtimes that have come into my life. I did not know that she was coming. But I should have known something wonderful was. Something always is. We get, and do not get, things for which we ask. The rhyme and reason often evades us. But there is always some little Grace coming, to lighten and brighten. There is always a warmer, sunnier day. I hope that loving her makes me remember.